Director Jean-Pierre Jeunet is perhaps best known for his all-conquering quirky hit Amelie, which won him 5 Oscar nods along with box office success. 12 years and just two films later comes his latest quirky release – T.S. 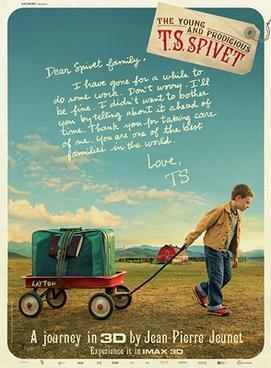 Spivet. The film begins on a Montana ranch where 10 year old T.S. (Kyle Catlett) lives with his insect-enthusiast mother (Helena Bonham Carter playing to type), quiet cowboy father (Callum Keith Rennie) and Miss America wannabe sister (Niamh Wilson). T.S. has invented a perpetual motion machine which wins a prestigious prize at the Smithsonian Museum in Washington D.C. and the film follows him as he runs away from home to make his way east and collect his award. This movie very much reminded me of a Wes Anderson film, in style, direction and storyline, and as I’m a fan of Anderson, perhaps that is why I warmed to it so much. While I accept that the film has its flaws – it is certainly twee and self-indulgent, with regular cut aways and some two-dimensional characters – I was willing to overlook that in favour of seeing the film as joyous, sweet and funny. T.S. can come across as annoying at times, but Kyle Catlett plays him with such innocence that we like him all the more for it and will him to succeed on his quest. There are tender moments too, with a particular scene where T.S. delivers an on-stage speech showing both his scientific maturity and his child-like naivety when speaking about his twin brother’s accidental death. I seem to be in a vein of seeing heart-warming, coming-of-age comic dramas with a pre-teen boy taking centre stage, and T.S Spivet follows in the footsteps of Chef and Boyhood as being excellent watches, albeit I enjoyed the others more. It’s certainly a shame that Jeunet doesn’t make more films than this, one every 4 years is a disappointing return. Encore!